A delegation from Denton travelled to Montigny-le-Bretonneux to commemorate the 100th Anniversary of the outbreak of World War One in conjunction with the Armistice Commemorations. An exhibition detailing the impact of war on Denton and its French and German twin towns was opened in Montigny. The exhibition will travel to Denton in the New Year, then on to Kierspe in Germany. The notion of friendship and unity was enhanced as bands from Kierspe and Montigny performed for crowds; “Imagine” from Montigny and “Monday Monday” from Kierspe. Danny Boyle’s film Joyeux Noel, which details the football match between French, German and British soldiers in 1914, was screened in the town. On November 11th, wreaths were laid by Andrew Gwynne MP, George Newton – on behalf of Denton Town Twinning Association – and Diane Roache on behalf of the Civic Mayor of Tameside. 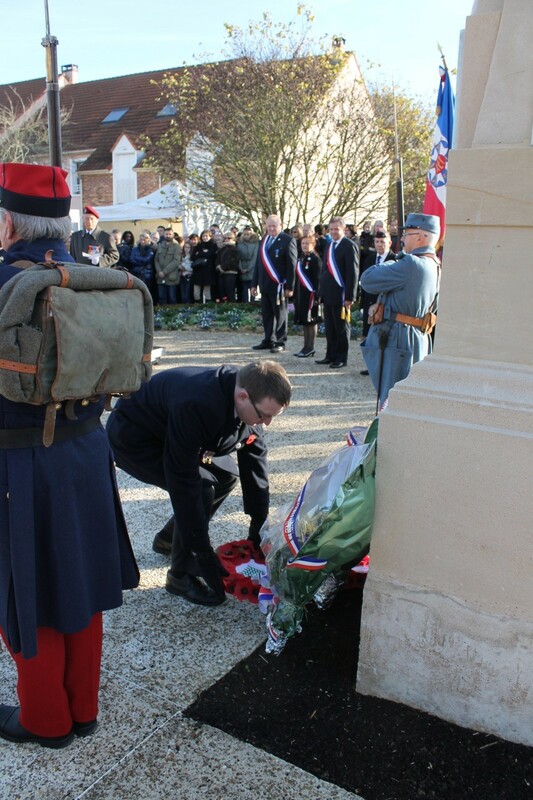 The wreaths were laid at the town’s cenotaph alongside a delegation from Kierspe and the Mayor of Montigny.